Picture this: It’s late at night. You just got home from drinks (and maybe even a dance or two) with the girls. You’re exhausted (seeing double? ), but that voice inside your head, the one that I like to call “reason,” keeps chiming in “take off your makeup or you’re going to wake up with a massive zit.” So, you surrender. But not before diving under the covers, rolling on your side and reaching for your Simple Exfoliating Facial Wipes. A few easy swipes to the face – and eyes, yes eyes – the makeup’s off and your skin is clean and revitalized. No water, no 30-minute nightly skin regimen. Easy peasy. Good night. While I wouldn’t recommend making a nightly routine out of skipping a good wash, moisturizer and eye cream, for those nights where you’re grappling between crashing out with a full face of makeup and wiping off the day, go for the wipes… every time… without fail. 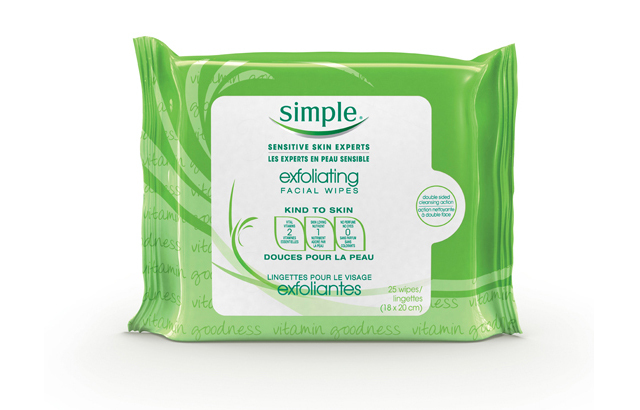 Simple’s Exfoliating Wipes are pretty spectacular. Not only do the double sided wipes do the trick of removing everything – and gently (ideal for sensitive skin) – the wipes are also slightly perforated to really get into the crevices of your pores and gently lift dead skin cells. Did you know that makeup that has settled into your pores and fine lines can actually enlarge those spaces? Scary to think that wearing makeup for extended periods of time (powders mostly) has the ability to deepen your lines. This is why it is so crucial to remove makeup – especially fallen mascara and eye shadow! – before sleeping. The Simple Skincare wipes contain Vitamin E and Aloe Vera, both incredibly soothing ingredients making these great to use in between washes too. For example, after a workout or, as Hope Solo, goalkeeper for the 2012 Women’s National Soccer Team told me, after her soccer practices. Because you’re not applying water and soapy irritants to your skin, you can use these wipes on-the-go. Swipe and get on with your day. However, I’m still partial to using them as a gentle makeup remover. No wrinkles for this face, thank you very much.